— Richard Rohr, O.F.M., Founder of Center for Action and Contemplation. 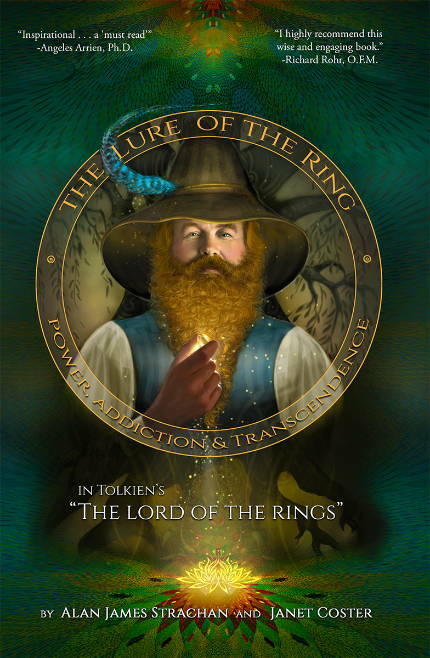 “The Lure of the Ring is one of those few books that honors and ignites the power and mystery of the interior life … an inspirational book that demonstrates how personal mythology directs our actions and organizes our experiences. . . . A 'must read' … so relevant for human beings, individually and collectively at this time in history!" One of the most compelling scenes in Peter Jackson’s visually arresting film version of Tolkien’s The Lord of the Rings occurs when Frodo the Hobbit and his Fellowship-of-the-Ring companions pause during their perilous journey to spend a night amongst the elves. Frodo has been entrusted with guarding and destroying the One Ring created by the Dark Lord Sauron for the purpose of seizing dominion over Middle-Earth. Sauron’s power is growing and Frodo’s harrowing quest to destroy the One Ring – and thereby prevent Sauron from acquiring such dominion – is in grave danger. Frodo can feel how resisting the corrupting power of the Ring already has begun to wear on him. He tells Galadriel, “If you ask it of me, I will give you the One Ring.” He holds out his hand, palm up, and on it rests the golden Ring of Power. Only twice before – when Frodo’s Uncle Bilbo offered it to him, and when Frodo himself offered it to Gandalf the Wizard – has someone offered to permanently relinquish the powerful and seductive Ring. “You offer it to me freely?” Galadriel says with surprise, and slowly approaches Frodo. Her hand is shaking as she reaches towards the Ring. Her voice suddenly resonant, throaty with feeling, she says, “I do not deny that my heart has greatly desired this.” A darkness begins to envelop them. Frodo looks at her, eyes wide, brow slightly furrowed. Fearful, Frodo takes a few involuntary steps backward. In this precipitous moment, Galadriel has learned something of surpassing importance: that she has inner strength to turn down the opportunity to wield ultimate power. Galadriel bends down to speak to him at eye level, “Even the smallest person can change the course of the future.”Galadriel, having refused ultimate power for herself, goes one step further: wisely she empowers Frodo with the knowledge that, though he might feel small and afraid by comparison with Sauron and the Ring of Power, he nevertheless has the strength within him to succeed. When they part she bestows upon him a small vial, a further precious gift. “I give you the light of Eärendil, our most beloved star. May it be a light for you in dark places, when all other lights go out.” (Walsh, Jackson and Boyens, The Lord of the Rings: The Fellowship of the Ring, pages 103-104). It is not simply Galadriel’s position of authority amongst the elves that allows her to give this second gift. More significantly, she is passing on to Frodo a symbol of the strength of character she has demonstrated in her own struggle with the One Ring, i.e., the strength to find light in the midst of terrible darkness. There is wisdom in Lord Acton’s well-known assertion that “power corrupts, and absolute power corrupts absolutely.” Power is seductive because it feeds the core need of our ego personality to be in control. Control assuages the fear and insecurity of the ego, nurturing its narcissism. The greater the power, the greater the opportunity – and therefore the temptation – to do whatever we want. Thus “absolute” power particularly is seductive because it feeds our narcissistic desire to have godlike control. Abraham Lincoln observed, “If you want to test a man's character, give him power.” In The Lord of the Rings, ultimate power, and therefore the ultimate test of character, is represented by the One Ring created by Sauron. The Ring of Power exerts a nearly irresistible pull, and throughout the story many are tested by its corrupting influence. In earlier chapters of the Ring’s history, we also discover that a young boy named Sméagol was not so wise, and that he succumbed to the dark power of the Ring, killing his friend Déagol to gain possession of it. Under its baleful influence, Sméagol eventually degenerated into Gollum, a miserable, pitiable creature utterly obsessed with desire to reclaim his “Precious,” the Ring. So, too, the Ringwraiths were altered by the Ring into the undead Nazgûl. They were at one time the nine Kings of men but, blinded by greed and power, they became Sauron’s “most terrible servants; darkness went with them, and they cried with the voices of death.” (Tolkien, The Silmarillion, page 346) Again and again we see the power of the Ring corrupting those who seek to possess it, turning them to evil even if their original intention is to use it toward noble ends. The psychospiritual development of the characters in The Lord of the Rings can be assessed by their response to the Ring. At one end is the Dark Lord, Sauron, who utterly has succumbed to his craving for power, and who is completely identified with the Ring. Then there are characters such as Galadriel, Gandalf the Wizard, and Frodo, each of whom mightily struggles against and, to varying degrees, resists the allure of the Ring. Later on, we will see – at an entirely different level of psychospiritual development – Tom Bombadil. He, and he alone, functions from a unique and radical paradigm in relation to power and the Ring.